Over the past year, I have written at length about how Stockton should grow in the future and how smart growth policies can bring stability and vitality to our region. All the while, there has been a plan in the works that will greatly affect what our cities will look like for decades to come. Since last November, the San Joaquin Council of Governments (SJCOG) has been working diligently on a plan that will direct Stockton’s transportation growth until 2040, which in turn will shape the city’s growth and development patterns. What is the Sustainable Communities Strategy (SCS)? In a nutshell, there are 18 regions across California that are developing plans to curb greenhouse gas emissions by reprioritizing transportation patterns as part of SB 375—California’s landmark greenhouse gas emission reduction bill passed in 2008. In our area, the San Joaquin Council of Governments (SJCOG) is responsible for putting together a Sustainable Communities Strategy (SCS) with the ultimate goal of reducing emissions by 5% by 2020 and 10% by 2035 (using 2005 emissions as a baseline). This is a lofty goal for our region in particular as the Central Valley population is predicted to grow by leaps and bounds during these time frames. 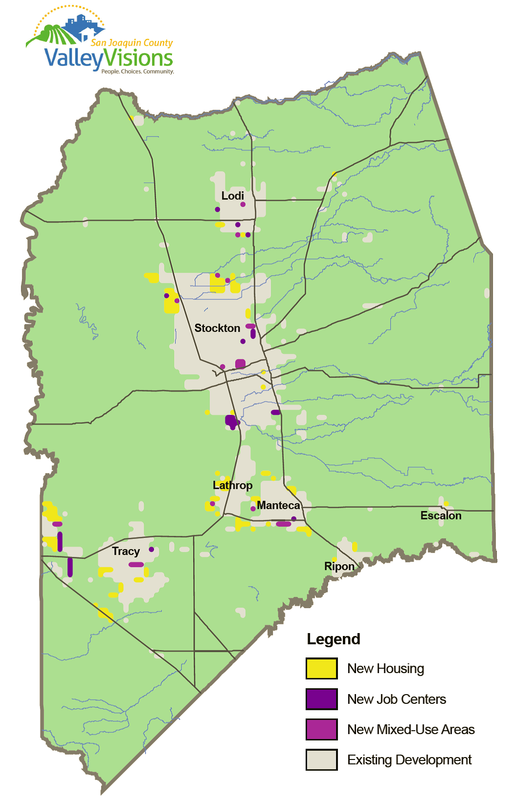 As such, SJCOG’s plan will go a long way towards shaping how and where Stockton metro area cities grow. The plan is still under development and plenty has to be accomplished before anything is finalized. But if all goes according to plan, SJCOG hopes to adopt a final plan by March of 2014. Until then, there will be many opportunities to weigh in on what we want our communities to look like for the next 27 years. To be clear, what SJCOG is doing should not be considered a land use plan as they have no actual land use authority over any municipality or private property owner. Regional bodies such as SJCOG cannot force cities or private property owners to do anything. However, SB 375 does give SJCOG the authority to set eligibility standards for federal and state transportation funds, and as we know, certain types of growth have specific transportation needs. According to SB 375, if a transportation project is not aligned with the region’s SCS, then it won’t be eligible for funding. For example, SJCOG’s SCS plan won’t stop a subdivision from going up on farmland, but the extra lanes and highway space needed to sustain that subdivision won’t be eligible for federal funds if it’s not a part of the SCS. Cities and developers are welcome to finance the transportation infrastructure themselves, but they just can’t use tax dollars to do so. In this respect, the final SCS will more than likely place a greater emphasis on transportation projects within existing cities, which would then encourage construction in downtown areas with easy access to various transportation options. Aside from transportation funding eligibility, SB 375 also incentivizes specific types of development by offering CEQA shortcuts. Specifically, transit oriented and mixed-use projects qualify for CEQA streamlining if they align with the region’s SCS, even if they conflict with local plans. If these projects meet various standards, such as a minimum net density and proximity to public transit, they can qualify for either a full CEQA exemption or an expedited environmental assessment. These maps are about a year in the making, with SJCOG working with planning departments in each city across the region, using general plans and previously authorized projects to determine where growth is most likely to occur. For instance, a big chunk of Stockton’s growth in all scenarios is concentrated in the northwest, reflecting projects that have already been approved by the city of Stockton (such as Grupe’s Sanctuary development). As you can see, the performance measures show that Scenario D reduces travel, wastes less gas, paves over less farmland, and uses less energy than all other scenarios. 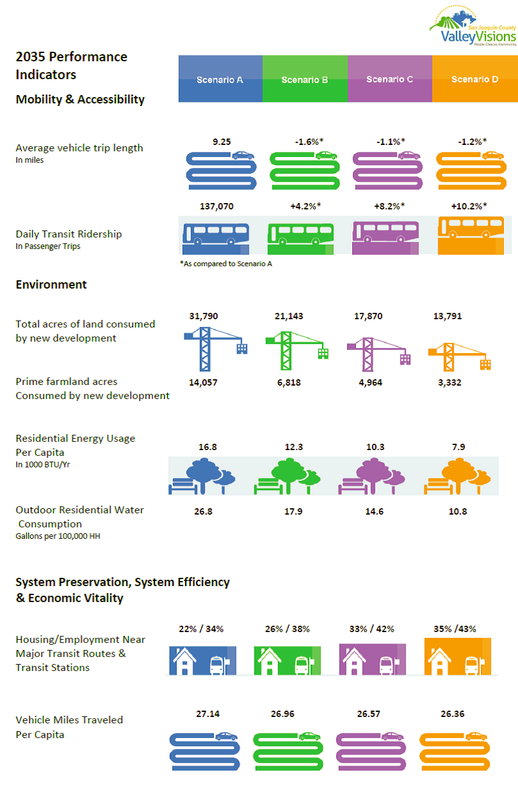 In addition, Scenario D also includes the highest amount of public transit ridership. As part of the SCS process, SJCOG has conducted outreach to the general public as well as various community organizations and business interest groups. So far, the public responses have been mixed, and even contradictory to a certain extent. The desire to live in a big house but also support infill development seems inconsistent, but both Nguyen and Hoyt have theories as to why they are seeing these mixed responses. For one, many people may prefer large, private homes, and new construction on farmland may impede this privacy or devalue their property. For these individuals, it makes sense to support infill development because it will keep people away from them, preserving their privacy. Another theory is that when instructed to select just one type of housing option, people will always pick the housing type they perceive as the most luxurious. Nguyen calls this the “American Dream” effect in that we all aspire to a life in a big home out in the country, even if we can’t afford it. In reality, however, those same people may also be just as happy to live in an apartment or condo (and probably happier when you consider walkability). To put it another way, if given the choice between a Honda, an Audi, and a Lamborghini—without any context— most people will probably choose the fancier sports car. If we had to actually purchase one of these cars, most would probably choose something more practical. On the other hand, SJCOG is finding that a significant majority of participants have shown the desire for more bike lanes, trails and public transportation options over new roads. SJCOG understands that while they are doing their best to reach as many people as possible, they may not be getting feedback that is representative of the region’s population. Most participants in public outreach surveys and meetings have been older and white, a demographic that is not representative of the community as a whole. To ensure a broader range of input, SJCOG has conducted extensive outreach to dozens of groups across all spectrums of interests such as the San Joaquin County Department of Public Health, Catholic Charities, the American Lung Association and the National Resource Defense Council. While no groups have officially thrown their support to any of the four scenarios, Nguyen says that most organizations have indicated their support for the positive elements presented by Scenario D. Environmental groups like the reduction in driving and preservation of land while health groups like the idea of fewer traffic collisions and cleaner air. In addition to community organizations, SJCOG also receives input from groups such as Visionary Home Builders, The Building and Industry Association of the Delta, and Campaign for Common Ground. Through all of these avenues, it’s tough to find a group or cause that hasn’t had a seat at the table during the SCS process. 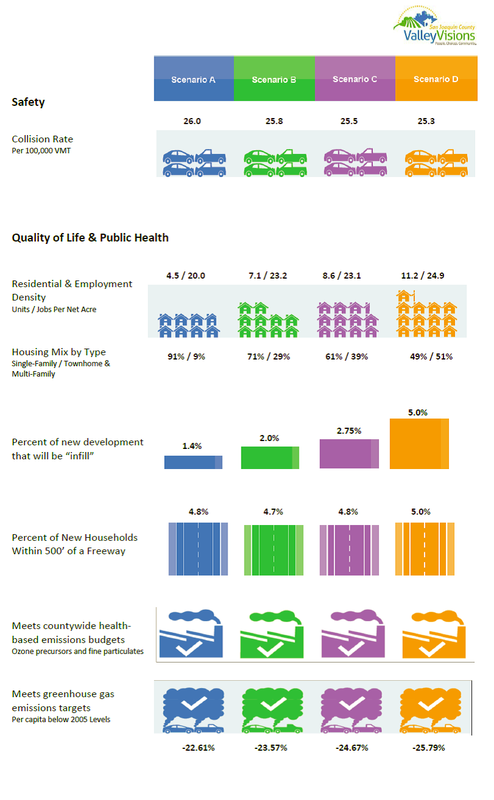 While most groups appear to be leaning towards Scenario D, elected officials apparently are not as keen on smart growth. According to SJCOG, several elected officials—SJCOG did not specify from which municipalities—have expressed their support for Scenario B, which largely reflects traditional growth and transportation patterns (i.e. sprawl). Hoyt notes that this process ultimately may not crown one of the four scenarios as the winner. A more likely outcome will be a hybrid of the scenarios customized to address the needs and concerns of each city. For example, Stocktonians may indicate their preference for more infill development while Manteca may prefer a more traditional, single family subdivision approach. This week, SJCOG is continuing with public hearings in each city. In November, a plan will be selected and there will be a 55 day public comment period at which point SJCOG will conduct its third round of public outreach. If all goes as planned, SJCOG will finalize the RTP/SCS in March of 2014. David, Scenario D sounds like the most ideal plan, however this appears only on the surface, for at further examination it does not account for unforeseen issues in addressing the costly ramification that will be generated from the vital need for expansion of aging infrastructural and service grid essential amenities that will be required under this direction due to excessive overload of existing aging city systems by an increased concentration of dense population that will exceed current capacities of utilities, water delivery, sewage, electric, waste disposal systems, garbage collection, and so on. If a city isolates and concentrates triple the population, for instance, within a limited city boundary it will over-strain the current infrastructural system that was originally designed and meant for a lesser population. There will be triple the sewage, triple the garbage, triple the electric usage, triple the crowdedness, triple the ambient noise, triple the people at the DMV and post office, and so on. City streets will be constantly in crisis with continual upgrades, repairs and reconstruction, due to digging up water mains, sewage lines, and putting in larger or more efficient conduit system upgrades, and so on, to bring the grid up to par for the increased population density, while also having to increase city taxes and higher utility costs, to pay for all the expansions and improvements that will seem never-ending. Whereas, when new neighborhoods, districts and communities are designed and constructed all these essential service amenities are apart of the financed development package without any affect, cost or tax burden on the other citizenry and their essential amenities and services. So I advocate for a happy medium for balance, due to Scenarios D’s potential for unforeseen costly surprises. Also, I think for a 30-year span these projection maps seem rather conservative. Frankly, I’d highly recommend a moratorium on any further growth and development at the North Stockton boundary line, which has expanded too far from the city center. Instead, all future growth and development should be diverted and encouraged with incentives towards the east side of Freeway 99, and isolated between the boundary of the Calaveras River to the north, Mariposa Road to the south, and Jack Tone Road to the east. 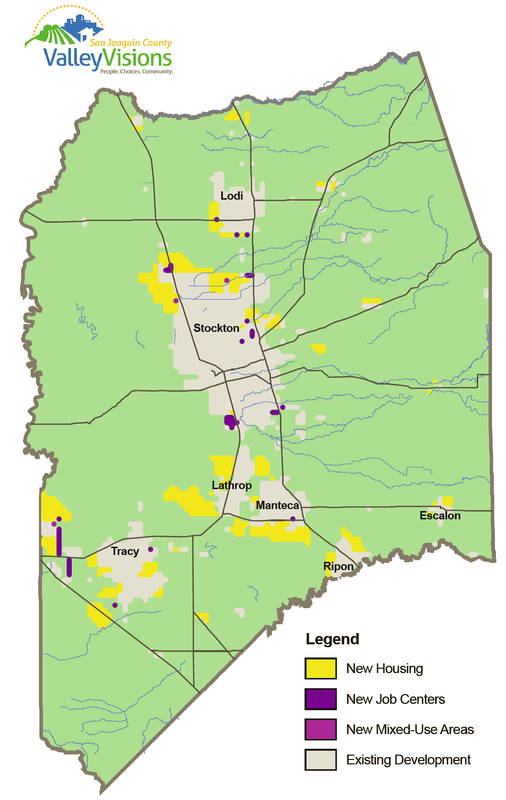 This makes far more sense in terms of geographical logistics and a much closer proximity access to Stockton’s urban core, because this underdeveloped region has several comprehensive direct east-west transportation thoroughfares that directly feed into Downtown Stockton, as well as the convenient and immediately accessible north-south major transportation artery of Freeway 99 and its Cross-Town Freeway connection into Downtown. Additionally, with the $839 Million new Stockton CDCR California Health Care Facility east of Freeway 99, which will provide nearly 3,000 new direct facility health care, nurse, doctor, medical, maintenance, clerical staff, and security jobs, having a projected annual payroll of $1 Billion, as well as a peripheral army of secondary support vendor services in pharmaceutics, laundry, meals, medical supplies, etc., then it makes total sense to develop a residential community in close encompassing proximity to the facility to cut down on commute time to this employment nucleus… a live near where you work strategy. So this facility can become a major strategic cornerstone for the development of the east side.